Oh, the delight of great Corned Beef! Sometimes there isn't much else to say! 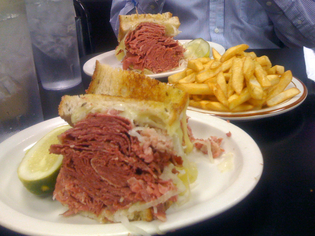 A work colleague, having discovered my delight in the great Corned Beef sandwich, invited me to his favorite place, Danny's Deli. It's his understanding that Danny's and Slyman's share a common beef source but that Danny's is better. We decided to venture out in January to have a taste. I'm happy to report that it was delightful. The brisk sharp air, the long walk to the bus and the long wait for the bus all no doubt contributed to the sharpness in appetite we each felt as the order was placed and the smells antagonized us. But the journey and the cold were well-worth it. They delivered an excellent Corned Beef experience (as you can see by the picture). The beef was lean, steaming hot, well-seasoned and properly jammed (mashed?) between two slices of very good rye bread. And the cheese! 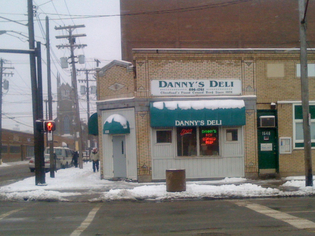 There's an art or craft to mastering how to properly assemble a Corned Beef sandwich and the folks at Danny's have certainly mastered it.